MONDAY APRIL 5, 2010 AT 7:00 P.M.
A. Approval of March # 2 Payroll in the amount of $37,915.56. B. Approval of Claims in the amount of $19,212.14. C. Approval of Minutes of the March 15, 2010 Regular Meeting. D. Approval of Budget Amendment in the amount of $7,262.86 for insurance proceeds on Police units. E. Approval of Transportation Enhancement Project Supplemental and Modification Agreement No. 1. F. Approval of lump sum retirement payment to Charlotte Huck who retired March 31, 2010. G. Approval of lump sum retirement payment to Charles Annis who will retire April 7, 2010. H. Approval to change Oklahoma Municipal Retirement Fund Notice of Authorized Agent to Melissa Whitlock. I. Approval of Cemetery Deeds: Bonita Drake, 2 spaces; Bobby Gaylord or Loretta Myers, 3 spaces; Lynn Kincaid, 1 space; Ranell Walker, 2 spaces. -- approved ... with a correction to the minutes under item 5 below on purchase of lights for park softball field. 6. Presentation of Proclamation for National Library Week April 11-17, 2010. 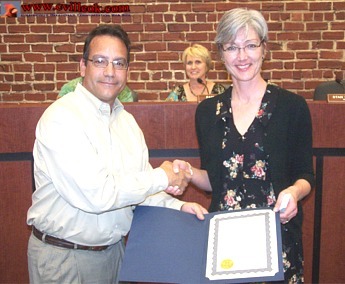 -- Mayor Stan Sallee read the city proclamation and presented it to Librarian Diane Schultz. 7. Discussion, consideration and possible action to enter into Executive Session for confidential communications with the City Attorney concerning the investigation, claim or action on pending matters with Bob Moore as allowed by O.S. 25 Section 307 (B)(4). * Recent meeting at Capitol on Oklahoma Tax Commission (OTC) failure to collect all sales tax due to Oklahoma cities ... and will continue to press issue. Also OETA interview on same topic. * City Clerk Angela Long wedding this weekend. * 700 trees arrived last week from Apache Tree Grant (& Up With Trees) -- need to determine dispersal plan for city and private use. 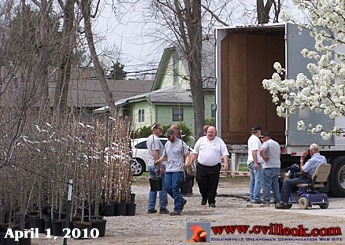 City workers unloaded the trees from a truck April 1, 2010. POSTED BY: Angela Long -- DATE: April 1, 2010 -- TIME: 11:00 a.m.
A. Approval of March # 2 Payroll in the amount of $24,047.57. B. Approval of Claims in the amount of $86,583.18.